Freelancers don't need to be local. The compensation will vary somewhat, but for a multimedia piece with a short accompanying text explainer, I'm thinking somewhere in the ballpark of $200. Contact Matthew Green with the material requested below – mgreen@kqed.org. I run a news explainer blog at KQED public media. It's called The Lowdown, and exists to provide background context and basic analysis on key news events. The site – which launched last year – is geared to both general audiences and high school social studies teachers interested in integrating current events into their curriculum. 1. Strong writing skills: must be able to produce well researched, accurate, and very clean copy that does not require a major editing overhaul. 3. Ideally (but not required), some degree of eduction experience. This is a perfect gig for teachers turned journalists. Having a basic understanding of high school social studies standards and some grasp of what it's like to be a teacher is a huge plus. A lot to ask, right? If interested, please send me a few clips (that illustrate your writing and multimedia skills) along with a list of your journalism/education experience and skill set. In terms of compensation, I obviously can't pay a huge amount (big surprise), but I do have some degree of flexibility, and am committed to paying a fare wage for solid work that I'd wager is a a good deal more than standard web journalism freelance gigs (I was a freelancer myself not long ago, so I've walked the walk). I should also mention that over a year ago, at the start of my project, a sent out a call for freelancers to this listserve, but decided I still needed to further refine the site. So, if you responded to me back then, and I never got back to you, sorry about that – it doesn't mean I wasn't interested! Please apply again. Snap Judgement is looking for stories. Check out their HOW TO materials and see their specific call for pitches below. Snap Judgment is looking for stories for our upcoming themes. We're looking for highly narrative, personal stories, with something at stake and a surprising plot. Here's our theme list, but if you have anything you think would work well, feel free to send it. Send pitches to pitches@snapjudgment.org. True stories about the fables that we share. We're working on a story about how the legend of an occult group from the 1800s became something else today, and an investigation of how rumors of vampires arose in New Orleans, thanks in part to a group of mail order brides whose luggage looked a lot like caskets. Maybe you have a story of a legend you and your friends came up with and later discovered the truth about? Stories that happen in limbo. An airplane terminal, a bus stop, in between relationships, in between jobs. The latest happens from CUNY. Colorado Public Radio is hiring for a bunch of jobs, some freelance, some F/T. Details HERE and below. The Colorado Public Radio Videographer/Photographer shoots, edits and processes video and photos primarily of performances and other activities in the CPR Performance Studio. In addition accompanies News and Music reporters in the field to shoot, edit and process video and photos of interviews, events and gathers stock photos and footage. The ideal candidate will have knowledge of modern professional video production procedures, practices, and techniques; principles of digital video capture using DSLR or similar cameras; professional digital audio recording, video switching, Adobe Creative Suite video, photo and audio editing software for Microsoft Windows. Also proper handling and troubleshooting of video production and post-production equipment. Broadcast experience is helpful. It should be noted that this position involves non-standard hours as needed (nights and weekends) as well as occasional out-of-town travel. The position requires good judgement, creativity, communication skills, the ability to work collaboratively, meet deadlines, and juggle multiple tasks as well as adequate vision, hearing and manual dexterity to complete assigned tasks. A valid driver's license required. Please send comprehensive cover letter, resume, three professional references, and a link to video examples or portfolio, to hr@cpr.org, with Videographer in the subject line. No phone calls or drop-ins please. Colorado Public Radio is an equal opportunity employer and encourages workplace diversity. Colorado Public Radio News is looking for someone to lead the news department into the digital world. This growing newsroom will launch a news website mid-summer and needs a leader who can build a team of three digital producers and work with broadcast reporters and editors to deliver a first-rate digital news experience. All of this in a place with fascinating news and ideas to cover. It’s also a great place to live – skiing, hiking, bike paths, art, music, plays, food, hot springs, Peyton Manning, microbreweries and lots of sunshine. Please send comprehensive cover letter, resume, audio samples and three professional references to hr@cpr.org with Digital Editor in the subject line. Competitive salary and benefits. Open until filled. No phone calls or drop-ins please. Colorado Public Radio is an equal opportunity employer and encourages workplace diversity. The Classical Host / Producer is responsible for creating an engaging daily airshift that is personable, timely, topical about classical music and local cultural events, interactive with the audience and delivered with the highest public radio standards for editorial content and announcing. Colorado Public Radio’s goal is to more deeply engage its audience and satisfy its cultural curiosity. This position will play a key role in that effort on and off-air. Essential duties and responsibilities include hosting a daily airshift either live or pre-recorded. Staying current on classical music news, events and issues locally, nationally and internationally. Bringing relevant and interesting information to the air as part of each shift and as part of ongoing teamwork with CPR Classical staff to strengthen the overall on-air sound. Staying current on Colorado cultural events tying them regularly into each show in a cohesive way. Initiating programming features, interviews and listener interactions for on-air work and CPR Classical, furthering CPR’s mission. Coordinating all features, interviews and production through the CPR Classical Program Director. Assisting in regularly contributing written classical content through CPR’s website and social media such as Facebook and Twitter, coordinated through the digital production staff. Be the “face” of CPR Classical in the community by periodically hosting station events, station sponsored events and live broadcasts. Participating in live and pre-recorded on-air fundraising as required. Requires Bachelor’s degree or equivalent experience, and minimum five years on-air announcing experience, extensive knowledge of classical music and the recorded repertoire. Requires writing, interviewing and editorial skills comparable to NPR feature writing, and working knowledge of audio recording and production equipment (production boards, Flash mics, Adobe Audition and/or ProTools). General PC computer competency, and excellent personal and inter-office communication skills a must. Travel and non-standard working hours may be required. Knowledge of NexGen or comparable audio delivery software program, excellent speaking voice, and public speaking skills, ability to periodically address large audiences, and familiarity working with social media are pluses. Please send comprehensive cover letter, resume, audio samples and three professional references to hr@cpr.org with Classical Host / Producer in subject line. Competitive salary and benefits. Open until filled. No phone calls or drop-ins please. Colorado Public Radio is an equal opportunity employer and encourages workplace diversity. TOC manager responsibilites include ensuring daily operations in the program automation system, scheduling program recordings and coordinating daily radio network operations, including transmitter monitoring, satellite uplink monitoring and automation system database management. Engineer responsibilities include for maintaining audio equipment and wiring in studios and equipment room, including an audio routing system, and for maintaining and repairing CPR broadcast transmission systems and sites. Must keep current with the state of the art for computer, computer networks, software, broadcast, RF, production and distribution systems and equipment. The Technical Operations Manager and Engineer position is evenly divided between the Technical Operations Center and Engineering department and will eventually transition to a full time engineering position. Position must adhere strictly to FCC rules and regulations and stations policies. Responsible for creating and modifying audio routing system triggers (macros), assisting in training staff on FCC and CPR requirements, serving as liaison for producers, management and clients. Responsible for monitoring CPR’s PRSS portal, booking and performing remote ISDN feeds and two-way interviews, monitoring NPR Squawk channel for program advisories, performing EAS tests, monitoring on-air and digital transmissions for quality, and creating and maintaining documentation for all procedures. Works closely with the New Media & Technology and Engineering departments to accomplish organizational strategic goals. Requires adequate hearing to make audio quality determinations and adequate vision to monitor minute changes in computer logging equipment. Must be able to perform during pressure or crisis situations. Requires working non-standard hours and being on an on-call rotation. Must live within 30 minutes driving distance of Colorado Public Radio’s primary studios at 7409 S. Alton Court, Centennial, CO. Please send comprehensive cover letter, resume, salary history , and three professional references to hr@cpr.org, with TOC Manager/Engineer in the subject line. Competitive salary and benefits. Open until filled. No phone calls or drop-ins please. Colorado Public Radio is an equal opportunity employer and encourages workplace diversity. The CPR Producer/Reporter produces interviews for Colorado Matters (our daily news interview program focusing on Colorado’s people, issues and ideas), and generates field reports that usually serve as set-up pieces for Colorado Matters interviews. Also occasionally covers breaking news for the news magazines and newscasts and supplies material for the web. The Producer/Reporter finds guests, and covers primary content areas: Government, Environment, Education, Business and the Economy, Science and Technology, and Arts and Culture. This position identifies trends, developing stories and best guests, writes a script for the host and edits audio for air. Reports features or uses field tape in production of the interview or provides tape or wraps for newscasts. May occasionally fill in for host. Coordinates website and social media content with Senior Producer and web producers, including audio, story summaries, and extended interviews, and writes and produces content for the web. Works with Public Insight Editor to utilize the Public Insight Network to develop stories, find sources and potential guests for Colorado Matters and produces reports. Participates in all assigned fundraising and outreach activities, on air and off. Requires minimum 3-5 years journalism experience: public radio experience ideal. High-level writing and editing skills, demonstrated ability to identify key developments and distill complex matters. Able to work collaboratively, meet deadlines, juggle multiple tasks and multiple deadlines. Position based in Denver, and requires working non-standard hours from time to time and some travel. Please send cover letter, resume, three professional references, and audio clips demonstrating a range of reporting, from deadline to in-depth features or enterprise work, and examples of on-air fundraising if applicable, to hr@cpr.org, with Producer/Reporter in the subject line. Application deadline is April 20, 2013. Competitive salary and benefits. No phone calls or drop-ins please. Colorado Public Radio is an equal opportunity employer and encourages workplace diversity. The Colorado Public Radio Health Reporter (link to full job description) covers a wide range of health care and related issues in the state and region, including the healthcare industry, legislation and public policy, insurance and the uninsured, and public and environmental health. Files reports for news magazines, newscasts, website, and other CPR News programming, with an emphasis on in-depth coverage. Primary focus on state and local issues and how national issues and policies play out in the state. Identifies trends and developing stories, and pursues enterprise investigative work to uncover stories that no one else is reporting. Researches, writes, reports, edits, and voices a wide variety of stories and series. Provides soundbites, wraps and voicers for hourly newscasts, and occasionally produces interviews for Colorado Matters. Collaborates with News Department on optimal placement of material. Contributes to CPR News website, including audio, text, extended interviews, photos, etc. Contributes to CPR’s social media platforms. Works with Public Insight Editor to utilize the Network to find sources and potential guests for stories. Serves as a resource for the News Department on healthcare issues – identifying sources and opportunities for additional coverage, etc. Participates in all assigned fund-raising and outreach activities, on air and off. Must be available to work during non-standard working hours and weekend on-call shifts, as needed. Requires extensive knowledge of the beat area (see above). Minimum 5 years journalism experience; public radio experience ideal. High-level writing and editing skills, demonstrated ability to identify key developments and distill complex matters. Able to work collaboratively, meet deadlines, juggle multiple tasks. Position is based in Denver with some travel as needed for reporting and professional development. Please send comprehensive cover letter, resume, audio/work samples, and three professional references to hr@cpr.org, with Health Reporter in the subject line. Competitive salary and benefits. Open until filled. No phone calls or drop-ins please. Colorado Public Radio is an equal opportunity employer and encourages workplace diversity. Colorado Public Radio is seeking three positions for an arts news bureau and online arts hub. CPR seeks an arts bureau editor (link to full job description) and two full-time reporters, one specializing in broadcast reports (link to full job description) and the other in digital content (link to full job description)- all with the highest level journalistic skills and a passion for the arts. This team will develop a comprehensive multi-media arts news bureau and significantly increase arts coverage of the Denver/Boulder metro area and across the state. Arts news will range from previews and in-depth stories about major cultural and arts organizations, to funding and sustainability of the arts, and connections to other topic areas such as education and state government. Reviews, interviews, audio and video performances, and events calendars will all be part of the online arts hub. Much of this coverage will be regularly featured on all three of CPR’s on-air services, CPR News, CPR Classical, and OpenAir, CPR’s new music service. The arts bureau’s online hub is intended to become a one-stop multi-media destination for arts news, information, and performances in Colorado. The new editorial team will produce a wide range of content beyond CPR’s current radio focus, including text, images and video. The arts bureau will also work with individual contributors with expertise in various art forms, who will add reviews and a broad range of additional coverage on-air and online. Please send comprehensive cover letter, resume, audio samples and three professional references to hr@cpr.org, with Arts Bureau Editor, or Arts Reporter/Broadcast, or Arts Reporter/Digital in the subject line. Competitive salary and benefits. Open until filled. No phone calls or drop-ins please. Colorado Public Radio is an equal opportunity employer and encourages workplace diversity. 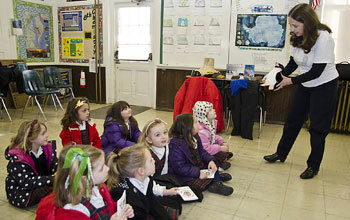 Polar Programs' Einstein Fellow Lynn Foshee Reed visits a classroom. The National Science Foundation (NSF) is accepting written proposals from media professionals to report on scientific research supported by NSF in Antarctica. In particular, NSF is interested in proposals from media whose work primarily is designed to reach children between the ages of 11 and 14. NSF envisions selecting a broadcast, print or online journalist whose work has a national scope and whose reporting would help to make the nation's young people aware of the importance of science conducted in the polar regions. It also is anticipated that selected media would focus on scientific and other career opportunities in the polar regions that are available to young people. NSF's Division of Polar Programs, which manages the Antarctic Program, has among its human-resources goals improving public understanding of the critical role of the polar regions in global processes; engaging the public in polar discovery; and helping to foster the next generation of polar scientists. Reaching the widest possible audience across a variety of platforms (broadcast, print, Web and social media). Partnerships with partners in informal education–science museums and aquariums etc.–to produce a possible live broadcast or webcast through these venues as part of the media visit. A proven ability to reach U.S. audiences in both English and Spanish, either through the outlet's primary production or through a partnership with another broadcaster. NSF's Amundsen-Scott South Pole Station, which is home to the 10-meter South Pole Telescope and Ice Cube Neutrino Observatory. Studies of population dynamics of penguins and seals in McMurdo Sound. The study of volcanoes in the McMurdo Sound region. As part of a comprehensive proposal, a request might be considered to separately visit NSF's Palmer Station on the Antarctic Peninsula, which hosts research into organisms and ecosystems, among other topics. For additional background on the U.S. Antarctic Program, please see the Polar ProgramsAntarctic Sciences Web page. How to apply: Applicants must submit to NSF a written expression of interest in participating in the program–the equivalent of no more than five printed pages–describing the media in which the reporting will appear and a description of the potential audiences. Competition for the opportunity to deploy is expected to be intense, as Antarctic logistics are a constraint on the number of deployments to be supported. Logistical limitations make it extremely difficult to modify itineraries once in Antarctica, therefore a great deal of advance planning with the principals, once selected, will be required to make the proposed visit successful. This planning may therefore necessitate frequent conference calls as well as some in-person visits to NSF. Selection: A panel consisting of science and logistics staff from the Division of Polar Programs and media officers from NSF's Public Affairs office and from NSF's Education and Human Resources directorate will review all proposals and select the finalist. The panel will look for proposals that indicate an understanding of the nature and challenges of NSF's scientific enterprise in the Antarctic as well as the desire and ability to communicate that understanding to the public. General reporting about Antarctica, travel or logistics will not be given priority. The program does not support feature-film proposals. Documentary filmmakers may consider applying to the Advancing Informal STEM Learning Program managed by NSF's Education & Human Resources directorate. Application Deadline: May 17, 2013. U.S. media receive preference in selection. Deployment period: Deployment would occur sometime between October 2013 and January 2014. Actual dates would be contingent on story planning and logistics discussions. Application: Applications that indicate solid working knowledge of the U.S. Antarctic program and its science goals and the ability to communicate the research being undertaken to a wide audience stand the best chance of selection. Peter West, Polar Programs' outreach manager, can discuss with potential applicants the requirements for Antarctic deployment and provide access to NSF-supported researchers who are scheduled to be in the field during the deployment. Due to the nature of this call for proposals, NSF envisions that freelancers will be unlikely to meet the suggested requirements for success. If, however, freelancers choose to apply, they must supply with their application evidence of a firm commitment, on the media outlet's letterhead, from the prospective media outlet that plans to publish or air their work. Medical: In order to deploy to Antarctica, it is necessary to pass rigorous medical and dental examinations. These examinations are conducted at the finalists' expense by their personal or corporate physician and dentist, using USAP medical screening forms, which will be evaluated by USAP-contracted medical experts. Certain medical conditions detected during the physical and dental examinations may disqualify a candidate from visiting Antarctica, even if initially selected as a media visitor. Expenses: Media selected for the visit, or their employers, pay for round-trip transportation to–and accommodation in–Christchurch, New Zealand (or, in the case of Palmer, Punta Arenas, Chile). NSF furnishes, at no cost to participants, cold-weather clothing solely for use in the field, as well as housing, transportation, and food while in Antarctica. Note: From time to time, the NSF has received requests for media opportunities from reporters who plan to travel to Antarctica at various times of the year via non-governmental means. Such requests are reviewed on a case-by-case basis. Such requests should be directed to Peter West, whose contact information is listed below. KQED is currently hiring for a full-time position in our online/radio newsroom and four on-call positions. We're looking for an engagement manager (social media guru for news). We are also looking for on-call online producers for arts and news, and on-call producers for news blogging and social media. There's just one posting for the on-call producer, but I thought it would be useful for candidates to know that we're looking for a range of on-call positions. The Interactive Producer, Engagement and Social Media is responsible for attracting, nurturing, and interacting with the community, online and offline. This producer manages social media initiatives and accounts, as well as serves as a steward of best practices for the organization. This role works closely with KQED News, its programs, and the newsroom to implement initiatives that build a two-way dialogue between KQED and its audience. This producer also works to develop and maintain Web products, such as interactive features, online events and other tools that grow the relationship between the organization and the community, and that promote regular usage of KQED's digital products and services. This position develops and deploys targeted online outreach and establishes professional relationships with influencers, bloggers, targeted diverse audiences, independent content creators, other media organizations and relevant tech companies. The engagement producer serves as the lead liaison to internal groups and external partners, and fosters continuing dialogue between the Communications Department, other social media producers, and News and other content producers. 1. Creates effective ways to generate, maintain, and communicate to a community of online users, including social media, email newsletters, blogging, customer service inquiries and moderating of comments. 2. Sets clear, measurable and attainable engagement and metrics goals using Facebook Insights, Google Analytics, Topsy, HootSuite, etc. and reports out regularly to key stakeholders. 3. Manages KQED News' social media accounts and serves as promoter for social media use among News staff, including providing protocols and trainings to teach interested staff members on fine points of platforms such as Twitter, Facebook, Flickr, mapping, and other online tools in collaboration with the News editorial staff. Creates and leads training sessions. 4. Serves as a point of contact for user-generated content, giving regular contributors a familiar face to interact with and piloting the flow of information. 5. Creates editorial contentin the form of feature package creation, selection and schedule of homepage features, hosting webchats, creating multimedia content, and blogging. 7. Develops and maintains partnerships between KQED and companies that build online tools such as platforms for community engagement. 8. Creates and executes strategies for Social Media Optimization and Search Engine Optimization for KQED.org<http://kqed.org/>. 9. Serves as a liaison between the News department and the Communications departments. Attends Communications department meetings for News and creates regular reports for the Communications department on News department projects. 10. Talks about social media trends and impact to various stakeholder groups, including national conferences, Community Advisory Panel, brown-bag lunches, and others. 11. Performs other essential duties as required. 1. At least one to two years’ experience working as an online community manager or maintaining a blog or website. 2. Knowledge and practices of social media sites is required. 3. Well informed in a wide range of areas, including current events, arts, culture, film, history, science, and public policy. 4. Ability to multi-task required. 5. Public speaking skills required. 6. Proven ability to build and maintain a wide-range of partnerships. 7. Knowledge & experience maintaining databases. 2. Experience as a working news journalist. 3. Experience working with different types of digital media content, including audio and video with the ability to perform simple HTML programming and coding. 4. Wide knowledge of Bay Area people, places, partners, and events preferred. 5. Public Media or news content experience desired. KQED is seeking a strong, multiplatform producer who can fill in for staff producers during vacations and illnesses, and to provide additional support with special projects or major initiatives. The Interactive Producer (Temporary On Call) is a skilled interactive producer with a background in producing content features and products for the web and mobile and working with a cross discipline team of editorial, design, information architecture, engineering, QA and promotion. The candidate must be able to handle projects from start to finish either as the lead project manager or in tandem with another assigned staffer, which could range from long-term product launches to breaking news. Functions include updating and managing web pages; planning, editing, producing and measuring digital content (text, photographs, graphics, audio and video); social media engagement and blogging, developing product requirements, managing project schedule, and communicating with key stakeholders. The Interactive Producer is capable of working with a variety of web publishing tools, content and project management systems and requires little supervision. The ideal candidate is creative, innovative and agile, with a passion for the intersection of editorial, user experience and technology. * Design, create and produce feature coverage and products, taking projects from conceptualization to research and development, through pre-production, production, post-production, delivery, evaluation and final report. * Serve as backup to other Producers, the Web Editor / Blogger and Reporters as needed to maintain consistency, timeliness and accuracy. * Serve as support for content supplied by staff and freelance contributors. This includes writing headlines, copyediting, publishing, and verifying online content. * Assist in social media engagement efforts including oversight of user generated content and communities. * Identify and track key metrics such as traditional pageviews, social media engagement and streaming media to help evaluate success. * Act as a source of ideas for new innovations and features. The Eurasia Foundation is calling for story ideas in a unique effort to document common social challenges faced by both the United States and Russia. Follow the link here, or have a read of the press release below. Latitude News is co-running the project – we’re eager for your pitches! Washington/Moscow – Eurasia Foundation is calling for story ideas in a unique effort to document common social challenges faced by both the United States and Russia. The project is part of the US-Russia Civil Society Partnership Program (CSPP) of the Eurasia Foundation, reports Maria Balinska, a former longtime BBC journalist and editor now based in Boston with the journalism startup Latitude News. Balinska is the U.S. coordinating editor for Common Stories. The Russian coordinating editor of the project is media consultant Veronika Menjoun, who has been working as a course leader and project manager at Sweden’s FOJO, the Institute for Advanced Training of Journalists for 16 years. Balinska said the project now seeks pitches for “feature stories with legs in both countries about collaboration between the United States and Russia” that fall within the scope of the CSPP’s eleven working groups. Those themes include anti-corruption, child protection, community development, education and youth, environmental protection, gender equity, higher education, human rights and rule of law, media and access to information, migration and public health. Pitches could, for example, focus on how the two countries are dealing with the problems of smoking cessation, domestic violence, obesity or waste management. Where the applicant would propose to publish or broadcast the piece in addition to the Global Journalist. The program is designed to highlight the potential for more systematic collaboration. While it does not provide financial remuneration, it will award an iPad to those four participants deemed by an expert panel to have produced the most outstanding work. The Russia-US Civil Society Partnership Program promotes collaboration between Russian and U.S. non-government organizations, with the aim of improving the lives of citizens of both countries. Program participants design innovative recommendations through CSPP’s Working Groups. CSPP is funded and implemented by Eurasia Foundation, in partnership with New Eurasia Foundation. The Mass Media and Access to Information Working Group is co-chaired by Anna Koshman, Director, Russian Association of Independent Regional Publishers, and Howard Finberg, Director of Interactive Learning, Poynter Institute. Just wanted to remind everyone that the deadline for the Alfred I duPont Awards is coming up. They start accepting entries on May 1. We invite you to submit local and national radio programming for a duPont-Columbia Award. Administered at Columbia's Graduate School of Journalism, the duPont Awards are considered to be the broadcast equivalent of the Pulitzer Prizes. Outstanding journalism, excellent reporting in the pubic service and innovative storytelling are honored by the jury. Past winners include radio documentaries about the fiscal crisis, post traumatic stress in Iraq war veterans and ongoing reporting about New York's Stop and Frisk program. ELIGIBILITY: Stories must have aired or appeared online between July 1, 2012 and June 30, 2013. IFP is currently seeking screenplays and documentary works-in-progress for its annual Independent Film Week Project Forum (September 15-19, 2013), the oldest and largest forum in the U.S. for the discovery of new projects in development and new voices on the independent scene. The Project Forum is a meetings-driven forum connecting filmmakers with producers, funders, distributors, broadcasters, sales agents, festival programmers, and more. Now accepting applications in three sections: Emerging Storytellers (for writers and writer/directors at the script stage looking to connect with producers and agents who can develop, produce, represent and finance their scripts), No Borders International Co-Production Market (for established narrative producers with partial financing in place looking to connect with financiers, distributors, sales agents and international partners), and Spotlight on Documentaries (for documentary filmmakers in production or post-production looking to connect with financing partners, broadcasters, distributors, and film festival programmers). Recent participants in Independent Film Week include Martha Shane and Lana Wilson's After Tiller, David Lowery Ain’t Them Bodies Saints, Benh Zeitlin's Beasts of the Southern Wild, Derek Cianfrance's Blue Valentine, Katie Dellamaggiore's Brooklyn Castle, Zachary Heinzerling's Cutie and the Boxer, Rama Burshtein's Fill The Void, Shaka King's Newlyweeds, Dee Rees' Pariah, Lauren Greenfield'sThe Queen of Versailles, Destin Daniel Cretton's Short Term 12. The latest from TRANSOM.org. I'm especially excited that they're bringing one of their trainings to NYC this summer. Application deadline is April 30. City Lore is offering a three-week documentary institute co-sponsored by Transom along with The Bronx Documentary Center and the Manhattan Neighborhood Network. The City Lore Documentary Institutewill equip participants with the skills to become cultural documentarians and multimedia storytellers. The radio track of the institute is intended to provide audio storytelling and sound gathering skills for beginning producers.